Samsung’s Galaxy S5 smartphone didn’t have the wow factor that we’ve come to expect from new smartphone releases. It was by no means a flop – with retailers ordering more S5s than they did S4s in the 25 days after both phones launched – however it didn’t impress as much as it could have. Now Samsung is back with a shiny new Galaxy S6 – it’s new metal and glass construct means it literally is shiny! – and it has clearly gone out of its way to set a new standard with the S6. For the first time, Samsung have released a phone which in terms of aesthetic build quality, is very similar to that of an iPhone. Also like Apple’s phone’s, Samsung’s latest Galaxy model does not have a removable back, meaning users cannot change the battery or add additional storage. This is the first time that Samsung and Apple – the two giants of the smartphone world – have made devices which in terms of design and build, are actually pretty similar. That gives us a golden opportunity to compare the two phones spec for spec to determine which is truly the best. The Galaxy S6 and S6 Edge are practicably identical in terms of tech specs, so for the purpose of this review I’ll be using the S6. 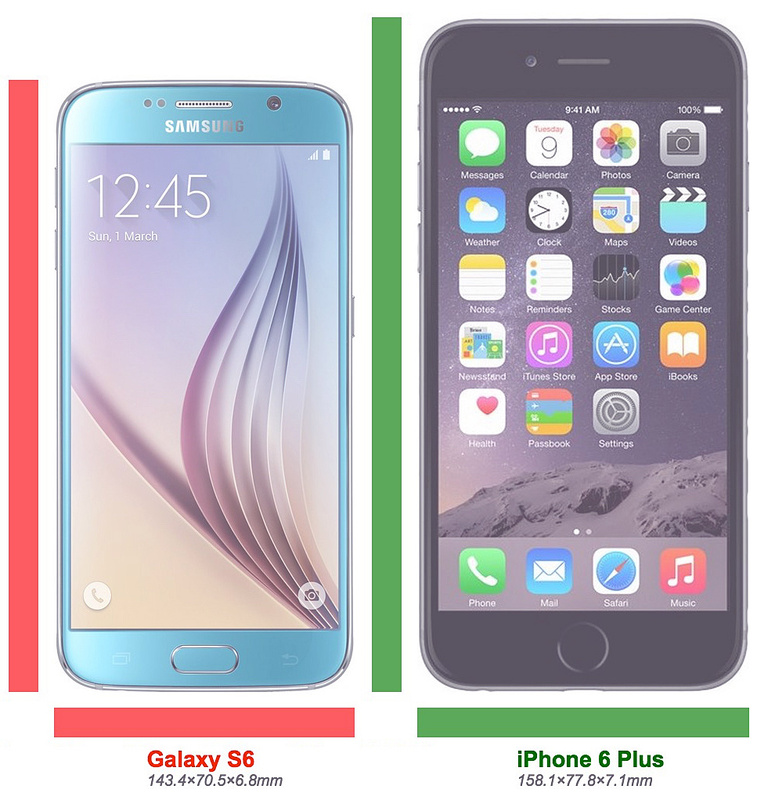 Apple’s comparatively priced and sized phone is the iPhone 6 Plus, so that’s what I’ll be comparing the S6 to today – the iPhone 6 Plus versus the Galaxy S6! You’d struggle to find a smartphone released these days which doesn’t come with a pretty competent camera. It’s a staple feature that most people have come to expect as standard from a new phone. The Galaxy S6 boasts a phenomenal new 16 mega pixel rear camera, and a 5 mega pixel front facing camera – great for selfies. Speaking of selfies, the S6 is super selfie friendly, as you can take a selfie in loads of ways – pressing the volume buttons, covering the rear facing heart rate monitor with your finger, tapping the screen, or pressing the capture button. The S6 can also film in 4K, which for those who don’t know, is four times better than standard, 1080p HD. The ability to capture up to 120 frames per second (only 60 in HD) is also a handy feature. The iPhone’s rear camera is only 8 MP and it’s front camera is just 1.2 MP. The iPhone supports face detection on both it’s front and rear camera’s – as does the S6. The iPhone 6 Plus can also video in sloooow mooootion (see what I did there?) at 60 frames per second in HD, but it trumps the S6 in terms of how slow-mo it can go – an amazing 240 frames per second. Camera tests, such as this one, and this one, show that in terms of camera it’s really a no-brainer. The S6 wins hands down. It’s cameras are both able to shoot at higher quality and leave images looking sharper than those produced by the iPhone. So you can make good use of the camera, Samsung has sped the launch up to just over half a second. Double click the home button and within a second you could be taking shots or shooting video – way faster than the iPhone 6 Plus. Now lets look at how fast each of the phones is. The S6 has some very capable hardware behind it, with two physical processors (1.5 GHz and 2.1 GHz) each split into 4 logical preprocessors, the S6 packs a pretty hefty 8 core processor, which is supported by an impressive 3 GB of RAM. The S6 is running Android with Samsung’s (now significantly slimmed down) TouchWiz ‘Disney Layer’ integrated on top. This is much faster, and less bloated than the TouchWiz seen on the S5. 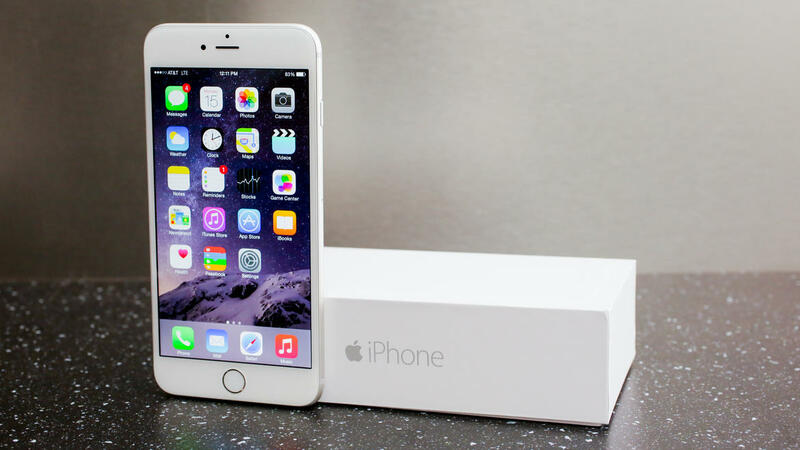 The iPhone 6 Plus has slightly more modest hardware, with one dual core 1.4 GHz processor, supported by 1 GB of RAM. It’s packed with the latest Apple mobile operating system iOS 8. In speed tests, the S6 obliterates the 6 Plus. Despite it’s inferior software, iOS 8 does a really good job of using the iPhone’s limited hardware to get the best performance out of the phone. Whilst it seldom wins speed tests, it’s usually not far behind the S6. One of the most important feature’s of any phone is the battery life. 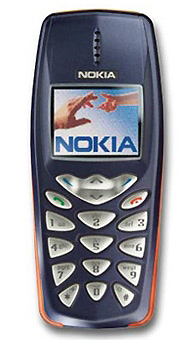 There’s no point in having a flashy gadget if you can’t use it because it’s got a shocking battery life. Battery life doesn’t appear to be improving that much, or too rapidly either, and if I want a phone purely for battery life, I’d still use my old Nokia 3510i! 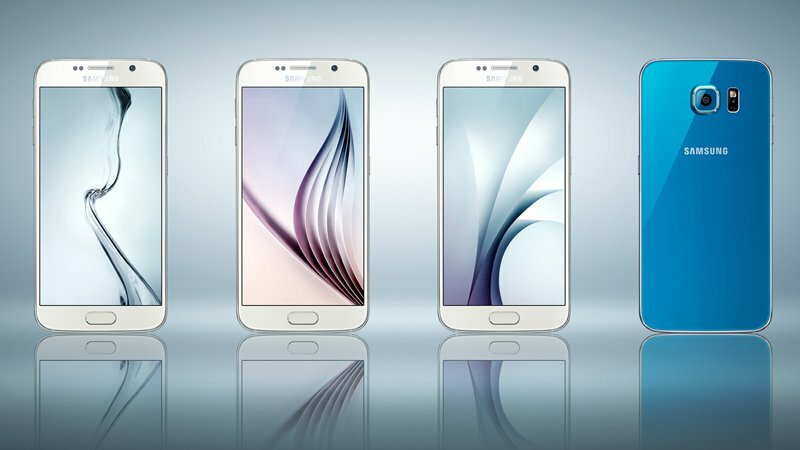 Samsung’s S6 has gone backwards in terms of battery life compared to it’s predecessor, the Galaxy S5. GSM Arena ranks the S5 the 16th best smartphone/tablet ever in terms of battery performance; comparatively the S6 with its 2,550 mAh battery ranks a pitiful 46th. Something to consider regarding the battery of the S6 is that it can charge wirelessly and it supports fast charging and ships with a fast charger. It also supports wireless charging. Better battery life than all smartphones! On the same GSM rankings the iPhone 6 Plus ranks much better, coming in at 25th position – way ahead of the standard iPhone 6 which ranked a shocking 90th! This is largely thanks to its much bigger 2,915 mAh battery. You can talk for up to 20 hours on Samsung’s S6 before it runs out of juice, whilst with Apple’s 6 Plus you’d get an extra 4 hours of nattering. The Galaxy S6 comes in slightly better than the iPhone 6 Plus in terms of web browsing time and video playback however. Ultimately, despite the fact that it’s easier to charge the S6, the 6 Plus has a bigger battery and seems to last longer, so this one’s a win for the iPhone. Finally I’ll explore a few of each phone’s other features. The iPhone 6 Plus has dimensions of 158.1×77.8×7.1 mm. The Galaxy S6 is slightly smaller in all dimensions, including depth, where it is 0.3mm thinner than the iPhone; its dimensions are 143.4×70.5×6.8 mm. 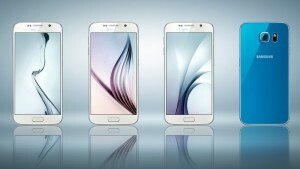 Samsung’s flagship phone comes in three sizes, 32GB, 64GB and 128GB. Apple’s alternative also comes in 3 sizes, a smaller 16GB, 64GB and a huge 128GB. As I mentioned earlier, neither has expandable memory. The iPhone’s screen is 5.5 inches, which is bigger than the Galaxy’s 5.1 inch display. Despite the iPhone’s bigger screen, Samsung wins in terms of pixel density, sporting an impressive 576 PPI, compared to the Apple alternative which has only 401 PPI. On the day of publishing, the iPhone 6 Plus costed £699 GBP from Apple’s website. This is for a SIM-free, 64GB version with the device. The Galaxy S6 costs slightly less with a SIM-free, 64GB version of the phone costing £640 from Samsung’s website. It has a better camera, it’s faster, it’s smaller, it’s got a better screen and it’s cheaper – how could I not choose Samsung’s Galaxy S6 as the winner. Apple’s iPhone 6 Plus does have a better battery, and it is a very good phone, but it is 6 months older than it’s Samsung rival and despite inferior technology it still costs more. No wonder Samsung has regained the smartphone sales crown. Samsung have really upped their game with the S6 and that will no doubt cause Apple to up theirs when they release their next phone (expected to be the Apple iPhone 6S) in a few months time. What could the advantage be of making a phone without a removable battery? Surely the battery will lose it’s holding power, and the phone will have to be thrown away, and the owner will have to buy a new one. Oh, I answered my own question it seems! And to add to that the camping problem. When I go camping I take a fully charged battery with me, so when my phone runs out (3 to 4 days) I still have a spare. I whip it in and am connected once more. These phones are designed with one lifestyle in mind, throw away, and with constant access to electricity. This is going backwards in terms of design. Ha ha, you do make some sense Mr H. Many people now take power bars with them they are portable batteries you just plug in and it recharges your phone. Then just like a spare battery you need to recharge them too. I think you are right on the battery design front, most will only last maybe 2 or 3 years if you’re lucky. Samsung give a 2 year warranty as do most manufacturers bar Apple who only give a 1 year warranty. If it goes pop in those 2 years they’ll replace it for free. I assume there must be certain technical benefits to having a sealed unit, but I agree I would rather have a removable battery like I had in my S4 Mini.